If you haven’t seen the Prager University video on this topic, it is well worth the 5 minutes! People need to remember that the US Constitution gives sole authority to decide how state electors are picked to the state legislatures. There is not even a requirement that the SL’s allow a popular vote, the legislators themselves could decide to vote themselves. Several states worked in this manner with the last one not changing until after the War of Yankee Aggression. 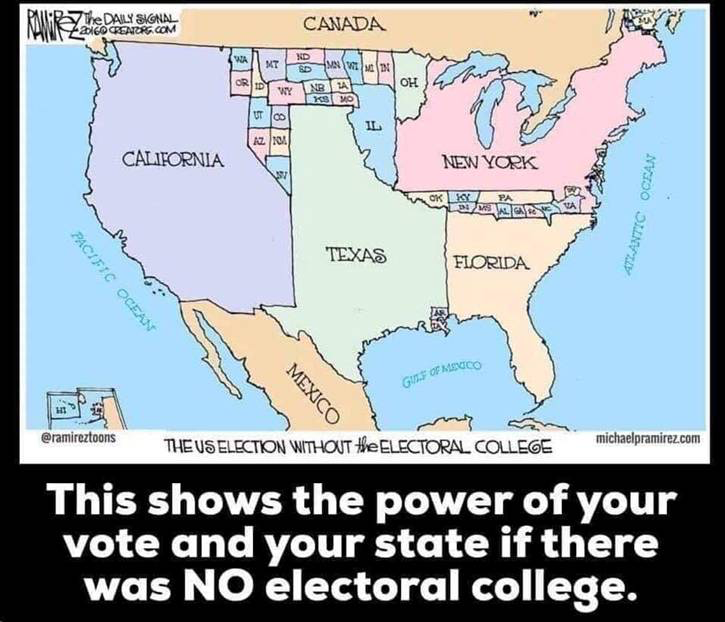 So if the state legislature of your state chooses to give all of your state’s electors to the winner of the national popular vote, it is constitutional. Having the FL state legislature pick electors was discussed during the Baby Bush/AlGore election. This is a battle that must be fought in the states, with you contacting your state legislator to tell him not to vote for the “National Popular Vote” agenda. You are currently reading "The U.S. Without The Electoral College", entry #20982 on The Captain's Journal. This article is filed under the category(s) Politics and was published April 14th, 2019 by Herschel Smith.